HF: “No. 118 Wellington Street was the main office of a bakery which was founded in 1889 and operated under the firm name of “Ching Loong” (正隆). In July 1923, Mr Ho Hong Po (何康甫), in co-partnership with Mr Ng Min Sau (吳勉修) bought Inland Lot No. 173 s.A ss.1 s.A from a Chinese woman at the price of $45,000, where they set up the bakery office. On 20 January 1925, Mr Ho Hong Po (何康甫) filed an application for the registration of a trade mark for “the Ching Loong Bakery, of No. 118, Wellington Street, Victoria, Hongkong”. With its strict adherence to quality, the “Sunflower” Brand (葵花牌麵飽 餅 干中西 餅 食) gradually gained a reputation and became synonymous with quality. Founded in 1889, Ching Loong Bakery grew from a small shop to a household name renowned for its products such as moon cakes and bread freshly made daily to clients. 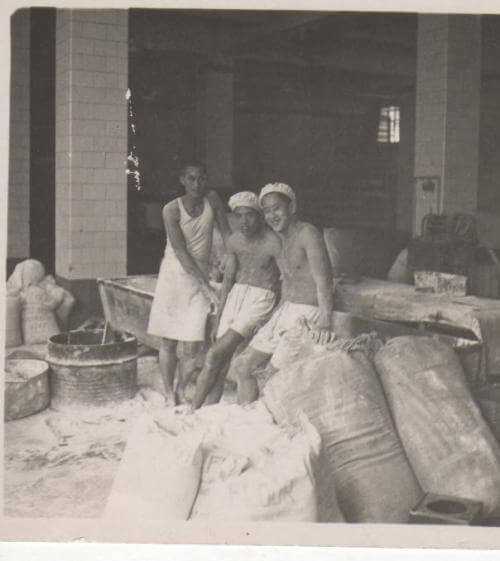 The Bakery was carrying out business in four premises in HK Island and Kowloon by 1939. During the period of Japanese rule (1941-1945), Ching Loong Bakery at No. 118 Wellington Street was re-registered by the House Registration Office set up by the Japanese to re-register deeds which were previously registered by the British administration before 1941. Its owners, which comprised members of the Ho (何) and Ng (吳) families, stayed in Hong Kong. One of them, Mr Ng Iu-sai (吳曜西) was described in Japanese archives as “正隆果子店支配人”. The Japanese surrender in August 1945 brought to an end almost 4 years of war and utter misery in Hong Kong, and the beginning of an interim military Historical Interest N215 administration that lasted until 1 May 1946. After more than half a century of development, in June 1947 Ching Loong Bakery was incorporated under the Hong Kong Companies Ordinance, 1932, and became a limited company. This article was first posted on 16th February 2016. I am the fifth son of Ng Iu-cheung (吳 曜章). I was glad and a little surprised that I ran into this write-up about my family’s former bakery, Ching Loong Bakery. I still remember the time when I visited the factory when it was busy making moon cakes before the Mid-Autumn Festival. I am looking for an old photo of the Ching Loong Bakery Factory on Queen’s Road East in Wan Chai.